When it comes to your wellbeing – inside and out – diet is unequivocally important. As someone who once lived on junk food believe me, I understand how intimidating a healthy lifestyle can seem. But the truth is, once you know the basics and get a little practice, living healthy can come quick and easy. Feeling the results is the best way to convince yourself that eating healthy is worth the trouble. Once you get a taste of the energy and confidence healthy eating delivers you won’t ever want to go back. To get the best possible information on the importance of diet, I spoke with nutritionists and personal trainers across the island, asking them for tips and tricks for nutrition. I especially was interested in finding out about “myths” of diets. With their professional and educational background in the field they were able to shed light on many aspects of health and nutrition I hadn’t even considered. What are some of the known and unknown benefits of a nutritious diet? Your diet dictates not only your personal health but it has the ability to affect your mood, energy level, concentration, sleep habits, andso much more. People are familiar with the concept that a healthy diet can prevent issues like heart disease or diabetes but oftentimes people are less aware of the other staggering benefits a balanced and healthy diet can have. A good diet can be neuroprotective, meaning it helps brain function starting from an early age and on, helping mental agility and focus on a day-to-day basis and overall in an individual’s lifetime. Diets can also be helpful in fighting certain symptoms from a variety of diseases since many foods have either inflammatory or anti-inflammatory properties. Another incredibly crucial benefit of a good diet is mental health. A healthy diet has been shown to help with depression, anxiety, mood, and stress. With the right approach and by understanding different foods, your diet can mean you live a healthier, longer, and happier life. 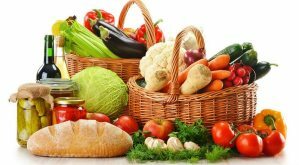 Are there general guidelines of a healthy diet? The most important thing when it comes to health is to realize that diets are not a one-size-fits-all type of thing. Although there are some general rules for healthy eating and healthy living, what works for one person might not work for another and it is important to find healthy patterns that work for you and can be implemented for longevity. There are too many fad diets to count. It seems like every other week people are swearing by a new diet that helps them to look and feel their best. Different foods have different overall effects and understanding those effects is a crucial step in discovering the best health paradigms for you. Only you can feel what really works for you and so it’s important to try different patterns and habits of healthy living. How much do ingredients matter in a healthy diet? The short answer is: tremendously. The cleaner the food the cleaner the body, but what does “eating clean” mean? To the nutritionists I spoke with “clean eating” means fresh, organic, and non-processed. If it isn’t made in a factory, the chances are it is healthier than the alternative. How does all this fit in with eating out or hiring a chef? When people make food into a chore, eating can become less enjoyable. This can actually have negative effects on your health. We all know the feeling and taste of a home cooked meal, prepared with thought and consideration. Chefs can bring this ceremony to dining, a ceremony that is not only enjoyable but healthy for a variety of reasons. Chefs know about food; it’s their livelihood and their life. When hiring a private chef, that chef can be the difference between you consuming chemicals or eating clean. It’s important to find a chef that cares about ingredients, one that appreciates the joy and health of food and is able to easily keep you, the consumer, in mind. The ceremony of meals can also be a health benefit in itself. Eating slowly is one of the best things you can do for your nutrition. By pacing yourself throughout a meal you are satiated quicker. Interacting with others during meals not only improves the overall experience but helps people naturally slow their pace. © 2019 Private Maui Chef. All Rights Reserved.